A decision on an application to build houses, business and leisure facilities on the Manston airport site will not be made before the end of this year, says landowner Stone Hill Park. A statement from SHP says although the application should have been considered by Thanet council’s planning committee by August 15 ‘the complexity’ of the situation has led to an agreed extension of December 31. SHP want to create some 3,700 homes, 46,000 sq m of advanced/hi-tech employment space, schools, a food store, cafes/restaurants, a 120-bed hotel and a health centre. Space for a small-scale campus for higher/further education is also planned as well as public, the retention of the non-operational part of the former main runway as a recreational and community event space and The East Kent Sports Village with facilities including Kent’s first 50m Olympic sized swimming pool and a WaveGarden surf lake. Plans also include the completion of the first part of a strategic link road through the site to allow for future connections to Westwood Cross. However, linked to the planning application are the issues of a Development Consent Order submitted by Riveroak Strategic Partners seeking development consent and compulsory acquisition powers over the land. The application has been accepted by the Planning Inspectorate for the pre-examination stage and public comment, via registration, is now open. RSP want to return aviation to the site with an international cargo hub and possibly passenger flights. The DCO application has to go through a pre-examination and then an examination stage before a decision on whether to grant the order is made. SHP says it will contest the DCO through the Planning Inspectorate process via representations and through the examination hearings. A second issue is Thanet’s Draft Local Plan – a blueprint for housing and infrastructure on the isle up to 2031. 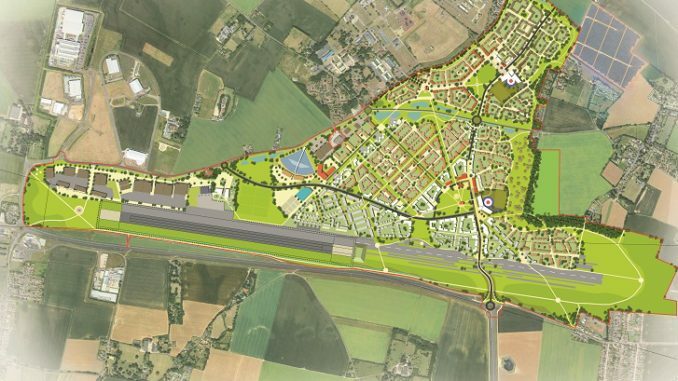 The plan, also currently open for public comment, does not allocate the Manston airport site for development. Initially it was earmarked for 2,500 homes in a draft plan that went to a council vote in January. However, this plan was voted down with the majority of councillors who voted against it doing so because they wanted aviation-only retained at the site. The aviation policies for the site currently in force will also not be retained in the new plan. Instead the draft local plan includes text that recognises the existing use of the airport and acknowledges the current DCO process for the site but specific aviation policies have been deleted as officers say they cannot produce evidence to warrant their inclusion. An amendment indicates that the status of the Manston site will be reviewed after a minimum of two years if a DCO or compulsory purchase of the land has not been agreed by that date. SHP director Trevor Cartner says the firm is ‘committed’ to its application for the site but due to the complexities will not appeal to the Planning Inspectorate over Thanet council’s failure to make a decision within the obligatory 16 week period. Mr Cartner said: “This is a big application for council officers to consider and they have a duty to ensure that they have examined every detail of the application, which includes an analysis of our environmental, archaeological, transport, and other survey reports and appraisals, the detail of which cannot be expected to be completed within a 16-week period. “TDC officers are in close contact with the SHP planning team, which is normal for a planning application of this magnitude and the outline planning application is a work in progress. SHP will continue to work with council officers towards the new agreed expiry date for a decision by the end of the year. Its a no brainer! SHP want to build 3,700 homes, (400 of which will be social housing so I understand) 46,000 sq meters of Hi Tech employment space, schools, shops, cafe’s, restaurants, 120 bed hotel, a Health Centre, a futher education campus, recreational & community space, a sports village, a 50 meter Olympic swimming pool, and a wave garden! Whats not to like? But the Thanet Tory Council don’t want this, and prefer to see an American Hedge Fund company RiverOak (RSP) fly in 12,000 cargo planes a year, 32 a day and night, low over Ramsgate Harbour at just 300 meters high, descending over Ramsgate town at 250 meters, over St Lawrence at 150 meters, and just 100 meters over the Nethercourt estate. In the process destroying the Harbour tourist industry, creating air and noise pollution, devaluing thousands of properties, destroying any chance of a good nights sleep for thousands, ruining education, and employment in the process! The Tory Councillors and others who voted for this, think it will be popular with the electorate who will vote them back into power! Are the people of Thanet that stupid? Already hundreds of people in Westgate & Garlinge are waking up to the fact that instead of Manston being able to build 3,700 houses, 2,000 will be built on their nice greenfield arable land, but why are they moaning, they voted in their Tory Councillors to do just this, didn’t they? Duuurh! Airport not houses, no jobs,problem people from South London how they don’t want will be sent here because they pay our council to take them crime rate will go up, wwx will be chaos even worse than it is now, if people don’t like the airport why did they buy a house next to one, it was here first. Dave if you don’t like houses then you’d better move as they are coming airport or no airport. Were you not aware of this? Surely Dave’s Mate is aware that according to custom,people aren’t allowed to say”If you don’t like houses you’d better move”? They are, however, allowed to say “If you don’t want to live near an airport, move”. I couldn’t agree more,I’m afraid Broadstairs and the surrounding area is being ruined by out of town shopping and houses. The whole attraction and character of the area is being eroded by greedy development companies. Leave things as they are, when the airport was in full operation it wasn’t an issue at least it was open ground ,I can’t begin to imagine the increased volume of traffic this proposed development would create insufferable!!! I for one will not be spending my holidays in the area!! 8 October 2018. To have a cargo hub of this magnitude and the volume of flights proposed, will bring nothing but misery to the beautiful town of Ramsgate and the surrounding villages. Any talk of nightflights is just scaremongering. And as for devaluing house prices, check out how much properties around Heathrow and Gatwick are worth! People need long term jobs and the airport will provide them. If you look at RSP’s plans, they are looking for night flights. Every flourishing cargo hub operates 24×7. If RSP don’t want night flights, they don’t want a cargo hub. There was an airport and Air force base here before a lot of the houses yet people still wanted to live and work in the area. 2 of my uncles an my father spent a lot of their enlisted time at Manston. An airport would bring much needed employment and economic boost to Thanet. Whilst housing is going to boost the pockets of property developers. If Thanet Council think the area needs more housing then why not cough up and let the people of Thanet have a share. I personally would love to see the Airport reopen and get back the fantastic airshows we used to have and to boost the economy with employment etc. According to RSP their new successful airport would have about 30 flights a day over Ramsgate. My house was here long before the airfield was! SHP have no money, they have been going around housing associations cap in hand as well as housing developers, RiverOak have sunk millions just to get to the DCO stage and promise a further £500 million in developing Manston Airport. I know who I am backing, SHP show us the money, nah! did not think you could. cannot wait for the re-opening of Manston Airport giving the youth of Thanet something to aspire to rather than lifeless shallow housing estates SHP propose. SHP own the land. They don’t need to “show the money”. On the other hand, RSP, who want to wrest SHP’s property from them, must show the money. What exactly is a “lifeless shallow housing estate”? In what ways do SHP’s mixed-use plans contrast unfavourably with RSP’s plans for a fully-automated cargo-hub airport? Anyone who prefers to see 12,000 aircraft a year, at least 32 day and night, according to RSP’s own DCO application, flying low over Ramsgate Harbour, at 300 meters, destroying the tourist industry, up Ramsgate High Street at 250/200 meters, and over Nethecourt at 100 meters, dumping air, and noise pollution on thousands, and devaluing thousands of properties, before landing at Manston, should seek help! Or is that they just do not live under the flight paths, or even in Thanet like Roger Gale, and Craig Mackinlay MP’s for North and South Thanet, the latter owning an aviation company! The major part of history ad far ad Manston is concerned is ad rather poor quality farm land! Quite a few people (bizarrely) want to see the airport reopened, but none of them explains how this might happen. In its 15 years (yes, 15, not 100) of commercial operation, it consistently lost money. Three firms went bust trying to run it. If you want to see it return, are you going to stump up the >£10,000 a day needed just to break even? I find your comments about moving quite dreadful. The airport, when it did run, had a few flights a day. That wad bad enough. Then it closed. Since 2014 loads of people in Ramsgate have bought houses – and there is no airport! RSP’s smbition is to have a freight hub, on the scale of East Midlands Airport, with scores of aircraft day and night. Why should we move? Can children move? Can schools (3 directly under the flight path, built long before KIA existed) move? Far better, surely, is to locate the airport (were one to be needed) away from where people live,study, relax and study? BYW full stops (“.”) are free. You might try sprinkling a few around. The airport supporters who say “If you don’t like the airport and the noise then move” probably haven’t thought about what they are saying. There are hundreds if not thousands of local residents who don’t want to live near the kind of airport RSP say they want. Last night there was a packed meeting-hundreds of people attended- in Ramsgate. It was obvious that very many people have not been properly informed by RSP about their alleged plans. The misinformation spread by pro-airport groups has helped to disrupt and skew the actions and opinions of TDC so much that even if/when RSP doesn’t get hold of SHP’s land, the folly of some of our local councillors is likely to cause uncontrolled house-building on greenfield sites not previously allocated for housing.